Pineapple Express conducts deliveries for Delta 9 Cannabis and the hectic pace of business hadn’t let up on the second day of legalization. Manitoba and Saskatchewan are the only provinces where online cannabis sales aren't being conducted through provincially run websites. So businesses that have a licenses to sell cannabis through a storefront can also do deliveries out the back. In Winnipeg, it has proven to be extremely popular. Pineapple Express conducts deliveries for Delta 9 Cannabis and the hectic pace of business hadn't let up on the second day of legalization. "I didn't expect this, this is 20 times what I expected it to be," said Randy Rolph, CEO and founder of Pineapple Express. The company offers same-day delivery, but keeping up with demand has been difficult. Since online sales became legal at midnight on Wednesday, the company has been flooded with thousands of orders, which meant many people had to wait for their weed. Those delivery drivers had no idea what to expect on their first day, said fleet manager Curtis Ling. "I knew there would be high demand, but coming in day one I had no idea what to expect for volume," he said. "Everybody's feeling it. It's all over social media, all over the news, everybody's feeling the new industry the new legalization. It's just been a wild, wild time." Ling has worked in the delivery industry for a long time, and he says delivering cannabis is similar to delivering a pizza, but there are differences. Security measures are much tighter, with strict rules around identification and address verification. Vehicles must be locked at all times, security cameras monitor anyone approaching the vehicle, and the drivers remain in constant communication with the dispatch centre. On their first day, Delta 9 received about 1,300 online orders. "In the back it's an absolute madhouse. 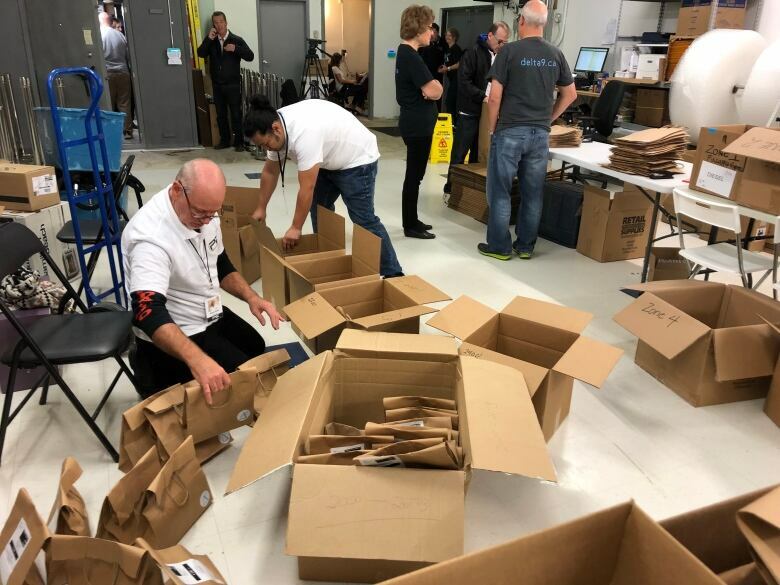 It's an organized madhouse, but we are shipping out hundreds of orders from the back of this store," said Gary Symons, communications director for Delta 9. "Through the day we were behind, because we literally didn't have enough people. We had a half dozen delivery people running out of here at all times and we just could not keep up." Symons expects online sales to be a big part of the business for some time, as the number of brick-and-mortar stores in the province remains fairly small. Only seven stores have been licensed so far. The goal is to get delivery times down to within an hour, but currently the company is making deliveries within three to five hours. "As we see that the volume is crazy we are going to hire another 10 to 15 drivers this week and next week," Rolph said.